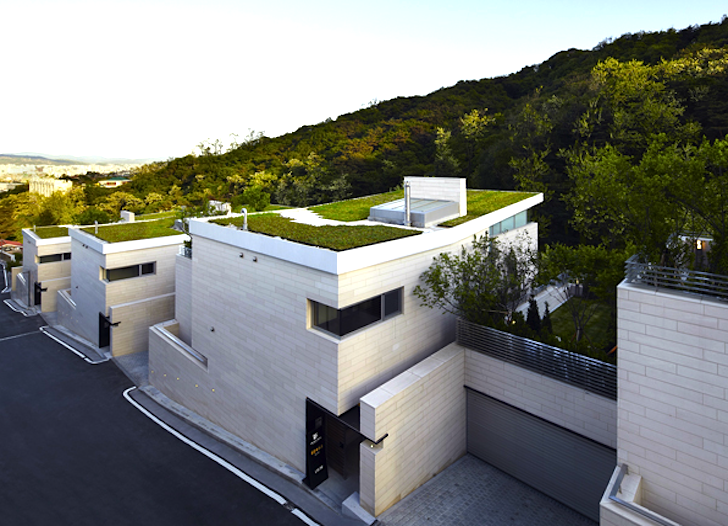 The grassy eaves lining the tops of these twelve staggered homes in Seoul aren't your run-of-the-mill green roofs. Designed by Joel Sanders Architect in cooperation with Haeahn Architecture, these living roofs are planted with a variety of sedum species that bloom at different times of the year. As a result, not only do the green roofs insulate the buildings, but collectively they also welcome each new season with a symphony of colorful plants. For more about what makes these Seongbukdong residences a breath of fresh air, punch the jump and read on. The designers took advantage of the site’s steep slope by staggering the twelve green-topped units, which has the additional benefit of ensuring that each home has views of the surrounding valley. And although we’re not in love with so much sameness, at least each of the units has a beautiful green roof and two terraces that reinforce their connection to nature. There’s no risk that these roofs will become as overgrown as these awesome Norwegian homes featured previously. Giant windows bring in plenty of natural lighting, keeping electricity consumption to a minimum, while generous overhangs keep solar gain at a comfortable level. Superstar architects Joel Sanders has teamed up with other firms before: check out this sprawling eco-community they designed for a site just outside of Palm Springs. The green roofs are planted with various species of Sedum.